what I was hoping for was more of what "Aussie F1" posted not all the other crap but serious input on HOW the teams will achieve KER? ^ Well good, finally a driver that support progress as opposed to bi***ing-winners-moaners like Prost, Senna, Mansell, Villeneuve, Alesi, Hakkinen. Williams F1 buy a Kenetic Energy Research company. Smart move Frank, smart move. However I should imagine Williams will have a good amount of information flow from the extensive research Toyota would have carried out in this area. Williams F1 has acquired a company called Automotive Hybrid Power Ltd, which was established at the end of 2006 in order to look at the technologies involved in the planned Kinetic Energy Recovery System which will be introduced in F1 next year. AHP has now become Williams Hybrid Power and its founder Ian Foley has moved his operations from Norwich to Grove. Foley is high-powered engineer, who was working for Benetton in Formula 1 in the late 1980s. He then went to Team Lotus where he was head of research and development under Peter Wright. One of his junior employees at the time was Sam Michael, now technical director of Williams. After the collapse of Lotus in 1995 Foley went on to develop cars with the Lotus GT team, which employed Jan Lammers, amongst others. For a period Foley dropped out of racing and concentrated on property development but was then lured back by Lammers to run the technical side of the Racing for Holland sports car team, winning FIA titles in 2002 and 2003. Since the team dropped out of sports car racing and went to A1GP instead, Foley decided to involve himself in other projects, notably KERS but also a system to accurately measure the speed of trains. The team believes that Foley's research will give then a head start in the race to get the most effective KERS system. thanks AussieF1 I read that article also and is interesting! Like how do you make a "Lightweight Flywheeel" and then make it spin at 100,000rpm and produce power ?? 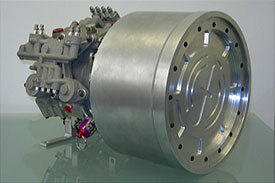 The engine flywheel is a KER subsystem inside the diesel or otto engine. Here's an article from Autosport on the subject, I'm paying for this, so I hate to let you all read it for free. As I've always said, a a twin-turbo V10 running one hydrogen would be just fine. And that was my 1,000th post.... was hoping to save that for something, erudite, witty, full of insight... ah well why change the habit of a lifetime? KERS is a huge advancement in technology, for years scientists have been unable to apply this idea to cars or other machines. This would be huge for formula 1, but more importantly for the everyday driver people use to get to work. Everytime a person brakes a large amount of energy (money) is lost. This would also greatly reduce pollution if used in everyday cars. I think F1 has the right idea here, and I would definitely like to see K.E.R.S. a part of the 2009 season. I agree. Gas mileage will be better with KERS. The only cars selling in the American market right now are the Honda Civic and the Honda Fit. Both get around 35 highway mpg. Which, for America, is quite good. (The California emissions standards mean you have to have all this heavy s##t on your car to reduce emissions, and therefore it kills fuel economy. That's why the new 67 mpg Ford Fiesta isn't coming here). Just thinking a 20Kg flywheel spinning at 60,000rpm is going to have a gyroscopic effect on the car - i.e. when turning the car there will be a resisting force from the flywheel. Surely this will have an effect on both the way in which it is mounted and also on the stability of the car??? OKOK how does KERS help the teams save money ? It doesn't, and it isn't 'green' either. No it isn't. But it is interesting. Hypnodisc! The flywheel-based KERS system developed by Williams for formula one will instead be fitted to Porsche's new 911 GT3 R Hybrid race car. The Grove based team told the media on Thursday that its energy recovery system, developed throughout 2009 but disallowed as part of a FOTA agreement this year, will be unveiled in the Porsche at the Geneva Motor Show next month. "We hope that this will be just the start of the evolution of hybrid systems developed for formula one moving across to applications where they can contribute to cleaner and more powerful vehicles," said Williams' chief operating officer Alex Burns. Williams said the technology will also be available to buses, trains, ships and wind power generation. Aboard the Porsche 911, however, Williams' KERS will see some racing action, with the German carmaker announcing it will contest May's Nurburgring 24 hour race. Until the current formula won't be thrown away, there won't be any hope for relevancy in F1. As much as I dislike the Delta Wing IRL concept, it does have its points: ground-effects, turbos, active differentials, non-stressed engine and gearbox layout and such.